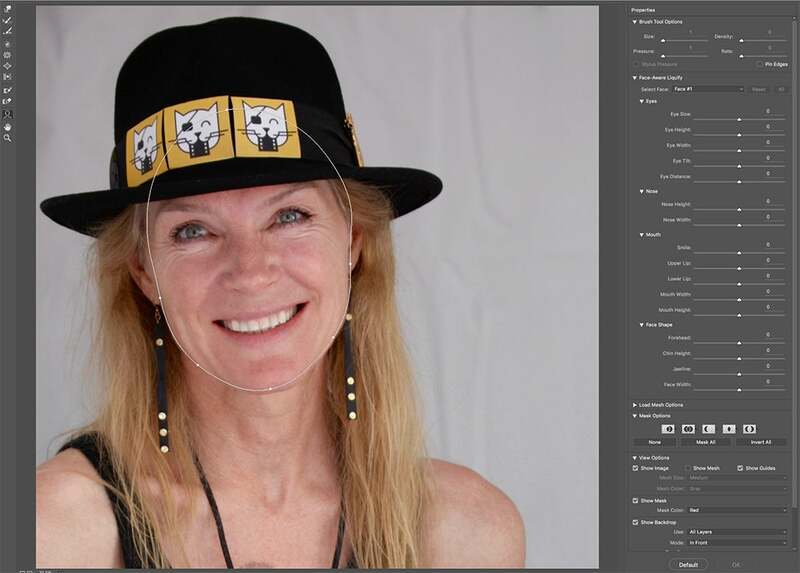 For a long time, it was hard to beat the buzz around Adobe’s Content-Aware Fill feature, a function in Photoshop CC that “sees behind” unwanted objects to automatically fill in appropriate background content. Later, Adobe expanded content-aware capabilities with additional functions like Patch and Move. On Tuesday, Content-Aware Crop joins the arsenal in Photoshop CC 15.5, part of the company’s Creative Cloud 2016 update. Other new Photoshop features in this release include Face Aware Liquify, Match Font, and a new Selection and Masking space. These join recently announced updates to Adobe’s video app suite and performance improvements. These updates are available immediately to all Creative Cloud subscribers. Why this matters: With Creative Cloud, Adobe needs to constantly add innovative features without disrupting the workflows of busy creative pros. This update adds useful but incremental changes that integrate seamlessly without adding layers of complexity. Like Content-Aware Fill, Patch, and Move, Content-Aware Crop can salvage areas of a photo that would otherwise be removed when you straighten a crooked image. It requires no sleight of hand: If you can crop, you can use this feature. To crop your photo, make sure to check the Aware box at the top of the window. Photoshop then reads the contents of the image and fills in the contextual background. 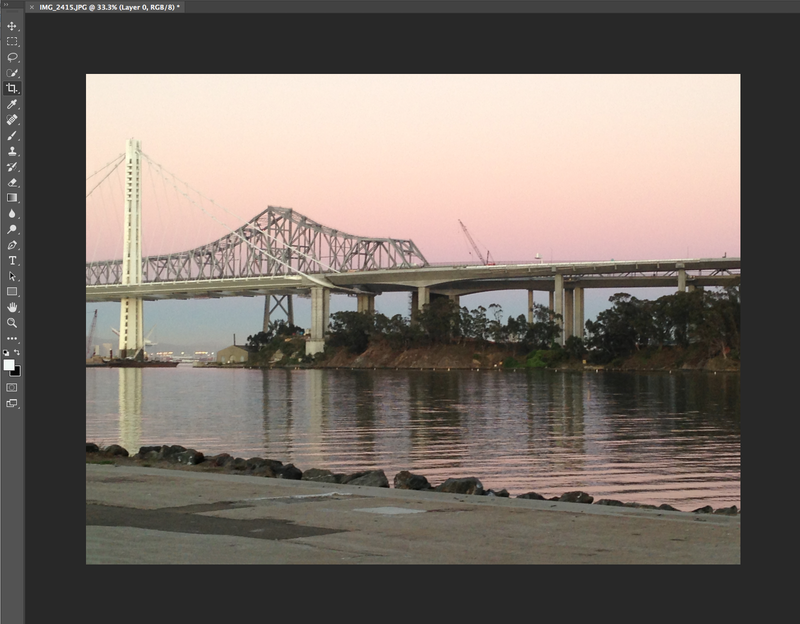 This is an easy way to fix a slanted horizon without having to reduce the size of your image. 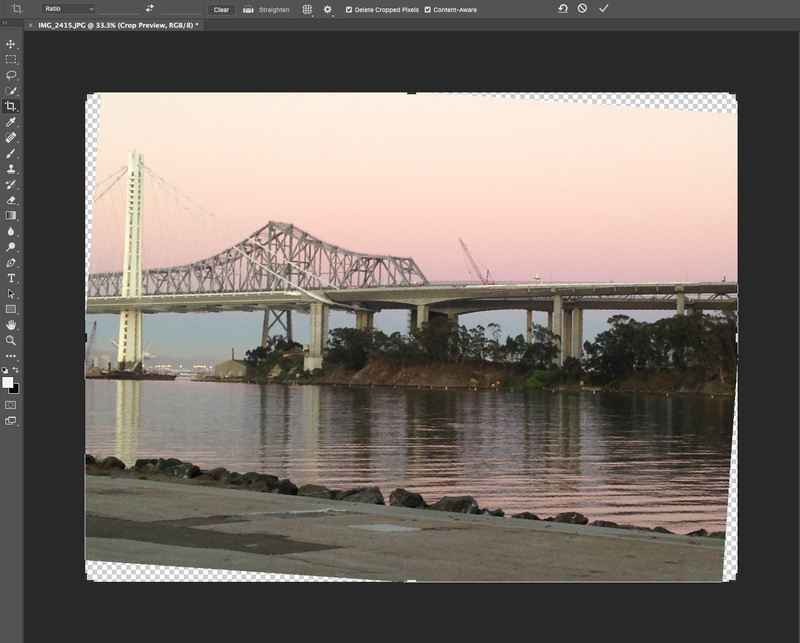 Below is the completed crop with the corners automatically filled in with Content-Aware Crop. The result of Content-Aware Crop. Photoshop’s Liquify filter is powerful tool that lets you push, pull, rotate, reflect, pucker, and swell the pixels of any image. It’s not for every picture, of course, and despite its popularity, it was rarely used for faces. Photoshop 15.5’s update of the Liquify filter now recognizes faces and lets you manipulate their eyes, nose, mouth, and face shape for a variety of effects, cosmetic corrections, and cartoony distortions. Use the mouse or slider bars on the right side of the window to make independent and scalable adjustments to facial features. The filter automatically recognizes multiple faces in your image, but they must be fairly prominent within the composition. Face-Aware Liquify lets you adjust face width, forehead and chin height, and jawline, to reshape your subject’s head. Then you can zoom in to tweak eye size, height, width, tilt, and distance. Correcting a squint, for example, is a matter of widening the eyes, but it’s worth noting that eye adjustments work on both eyes simultaneously. You can’t adjust one eye on its own. Finally, you can change the face’s smile, including upper and lower lips and mouth width and height. Making precise selections has been and remains one of the most tedious aspects of image editing. 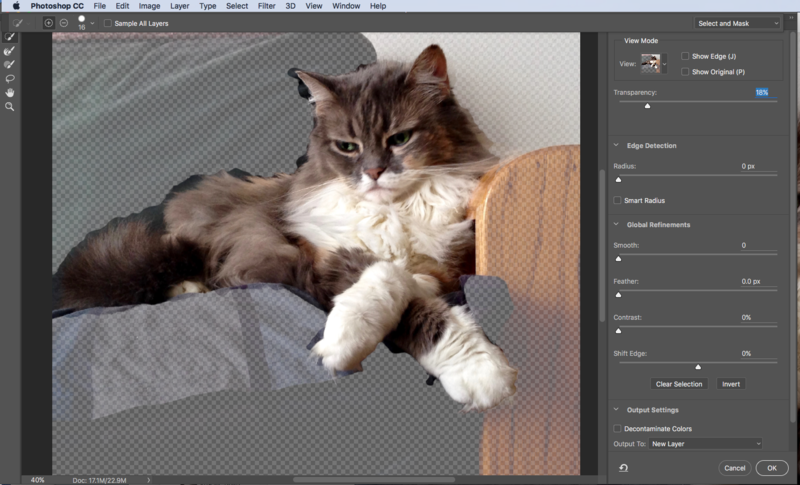 Over the years, Adobe has let Photoshop more easily select delicate objects like tree branches, hair, and fur. The new Selection and Masking space is a discrete place to concentrate on selections. When you choose Select > Select and Mask, you’ll get a new interface, with a Quick Selection tool to roughly separate the object from the background. In the new Select and Mask interface, an adjustable Onion Skin view makes everything transparent except the object you selected. 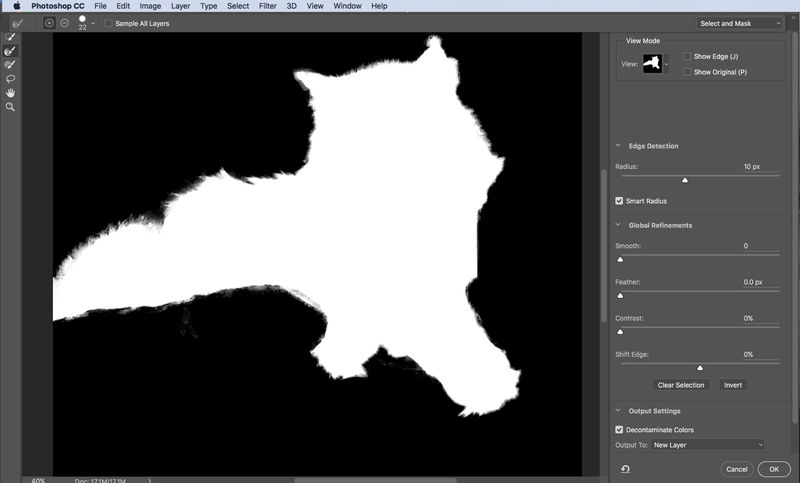 The improved Refine Edge brush tool now uses the GPU to render the results. Just brush over the edge areas. Check the Decontaminate Colors checkbox to help remove color fringing. To finish the selection, just brush over the edges. This fluffy cat was selected in practically no time. Adobe previewed Photoshop 15.5’s new Match Font feature last year at its Adobe Max creativity conference. This simple command under the Type menu can identify and analyze text within images—even in a flattened JPEG—and match it to fonts in your system or available on Adobe Typekit. If you don’t have a font, you can download it directly into your document for immediate use. The new Match Font tool is found under the Type menu, and found several similar fonts to this vintage lettering. I saw this funky lettering painted on to the side of a building. While I doubt it was meant to replicate any formal font, the text was stylized enough for Adobe to match it to a number of fonts that may give similar looks. With Creative Cloud 2016 come improvements to Adobe Stock, the image service launched last year and integrated into Creative Cloud desktop apps. A new one-click workflow from your Libraries panel lets you search, preview, tweak, and license images from Adobe Stock from within Photoshop. You can then share images with team members or clients, granting different levels of viewing and editing rights. 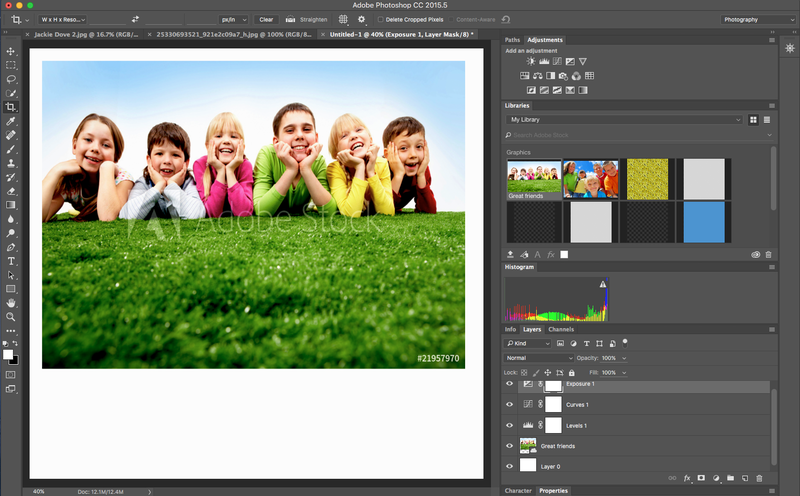 Search for and license new images from Adobe Stock from Photoshop’s Libraries panel. Accessing Adobe Stock from the web shows you all the images you have licensed and allows you to select new ones and open them directly in any Creative Cloud app. A new Premium Collection offers 100,000 curated images. Creative Cloud 2016 includes a number of productivity boosts, including up to four times faster performance on Content Aware and font functions, one-click export of assets and artboards in Illustrator to multiple formats and resolutions, and availability of Adobe Portfolio for creating photo websites. Adobe has implemented the new video features it announced at the NAB conference, including virtual reality features in Premiere Pro and a Character Animator preview in After Effects CC. The Adobe XD experience design tool preview is now available in German, French, and Japanese. Enterprise users benefit from simplified workflows for asset sharing collaborative teams, read-only libraries and folders, archiving support, and versioning abilities. Adobe Stock for enterprise includes the new Premium Collection, advanced search, additional payment options, and a unified dashboard to keep track of images and videos.